From the series Archaeology of the Ordinary by Nicky Bird. Nicky Bird is a photographic artist whose work is primarily concerned with social histories and how they are relevant today. Found photographs, the archive and forgotten sites have informed and impacted her work. Her approach to these subjects are intriguing; from bidding on unwanted family photos on eBay to unearthing writing on cottage walls, she creatively brings hidden stories to our attention. This interview will primarily discuss Question for Seller and Archaeology of the Ordinary. Question for Seller began when Nicky bid on family photographs that she saw no-one wanted on eBay. 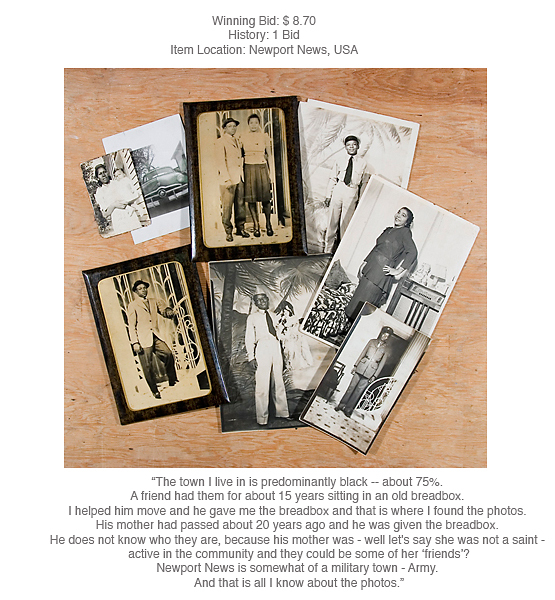 The project resulted in an exhibition of these purchased photographs alongside some background information from the seller. As part of an exhibition at Belfast Exposed there was a live auction where people could bid on the works, raising new and interesting questions as the pictures are arguably now deemed to be ‘art’ rather than unwanted family photos. Archaeology of the Ordinary is a fascinating foray into discarded territory and memory. In looking at marks left on their homes by migrant farm workers and later installing parts of the actual cottages into a gallery, this work poignantly presents what would be forgotten histories to a contemporary audience. Nicky is based in Scotland where, as well as continuing her practice, she is a PhD co-ordinator at Glasgow School of Art. Her work has been exhibited extensively and was recently included in Seduced by Art at the National Gallery, which is currently touring in Spain. Can you remember where your interest in ‘found photographs’ derived from? How to talk about this – and to then define that moment – depends on what we think ‘found photographs’ are. For lots of people this expression summons up the discarded analogue family snap, so the most obvious example would be the first group of photographs I bought on eBay that eventually led to the work ‘Question for Seller’ 2006. They were of an African American woman, with studio portraits of a couple of soldiers, and a snap of a car from the 1940s. I couldn’t believe they were on eBay, at such a low price and I was the only person to bid on them. An earlier moment I would point to – which brings a slightly different meaning to the ‘found photograph’ – is towards the end of my PhD (1998), I was in a picture archive in the US. On another table was a contact sheet of Elvis Presley in the 1950s, at a formal dinner table surrounded by immaculately dressed women. There was a picture editor’s pencil mark around his head – indicating the part of the photo they wanted to use. This cropping revealed in an instant the value of the picture and how they weren’t interested in the unidentified group of women. These issues interest me – so whether it is a photograph in its entirety or parts of photographs that are sort of thrown away, what other things do we throw out with them? What is it about this type of imagery that interests you so much? From the series Question for Seller by Nicky Bird. Throwing away old family photographs feels fundamentally wrong! Perhaps that’s because I’m a photographer. Did you have that sense when you began this project and did you feel like you brought some purpose back to those abandoned photographs, through the live auction and simply by making people look at them on a gallery wall? The process of collecting family photographs on eBay certainly began with a rescue impulse, particularly as I set myself a rule – that I would only bid on items nobody else wanted. They were below a certain price and whatever the seller told me in reply to my question ‘how did you come across these…’ was important. eBay (through price, location, one bidder and seller’s reply) then provided an alternative meaning to each batch, and each obviously added collectively to the overall project. So even when some of the batches were displayed on gallery walls, the information from eBay was an important part of the work. I think audiences were taken aback by the fact they were all found on eBay, and what their ‘market value’ was. The album I made was auctioned off on eBay, at the same time all the batches on display were auctioned off live – this was important to follow the logic of ‘market value’ right through to the end. On the matter of throwing things away, eBay is interesting as a sort of house clearance – in one way the photos can be seen as thrown away, but in another sense, it is a type of postponement i.e. why do people not just throw these photos in the bin? In fact, one eBay seller had rescued a batch of photographs from a skip, while another said that eBay sellers and buyers were new ‘custodians now’ for such materials… so it was interesting that both examples (the brutal and the benign) had a presence in Question for Seller. Gay Interest Beefcake worked in a different way where I noticed an eBay seller had split up a relative’s set of photographs into three lots. The seller also speculated on his relative’s possible gay – hidden – history, so that became about restoring the original set, creating an album with the seller’s statements, which effectively ‘queer’ quite ordinary photographs. That went on eBay too, and the mystery buyer turned out to be the International Center of Photography in New York. It’s nice to think that queer history via eBay are now being looked after in this collection…. There is a tension in your work between who we are today and how that connects to our personal and familial histories. What is it about your past that is important to you as an artist today? For me it is connected with class, particularly working class histories that lie on peripheries – whether that’s a photograph, edge of a building or a remnant in a rural location. There is a debt to feminism here – which is about looking out for the overlooked, questioning what’s valued (or not), creating new spaces to listen, reading against the grain and so on. There are a number of other artists concerned with hidden or alternative histories (gender, race, etc) and we might turn out to a certain age/generation. But the histories have to ‘speak’ to the present day in someway; that’s the artist’s ‘job’ if you like. I see my work as a form of rescuing something that might be considered mundane, unimportant or even irrelevant. Archaeology of the Ordinary reminds me of a childhood experience. When I was growing up in Northern Ireland, just outside Belfast which was practically the country, there were abandoned cottages and houses dotted around the landscape. I remember being fascinated with these places and the histories they embodied. I used to spend weekends and evenings trespassing in those dangerous old houses and wonder what types of people lived there. I would search for traces of past inhabitants in the wallpaper, the abandoned artefacts and the furniture. That’s interesting as the link with this project was the signatures made on the bothy walls belonged to Irish Migrant workers from the 1950s, mostly men. This project raised some questions for me about the potential limitations of photography. Your experience points to the importance of being a detective, the sense of transgression and an awareness that these places are haunted by history, and also neglect, abandonment isn’t just about the physical site, but what it represents. It also points to the importance of a physical, sometimes visceral encounter with a place. Quite early on in Archaeology of the Ordinary, I realized taking photographs and representing them in a gallery wasn’t enough so that project became about removing, preserving and installing a wall in a gallery that was really destined for the skip. What do you hope will result by connecting the viewer to the histories you unearth in your work? I am not alone in drawing attention to what hidden histories are lying about in family albums, or the landscape etc. However I think photography is a great mediator of past and present. I hope that the viewer – when they look at my work – does hear the voices and histories of others, but also recognizes their own – and asks questions about what we value in our culture, and what we don’t.